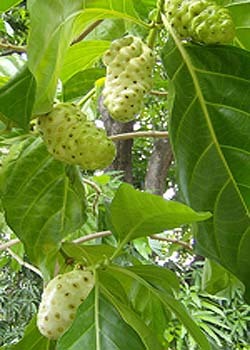 Noni is known as Indian mulberry, morinda, canary wood and hog apple. It is indigenous to Southeast Asia although it has now spread across French Polynesia, pacific islands, Indian subcontinent, Dominican Republic, Tahiti and Puerto Rico. Morinda has been used to treat skin conditions and joint pains. In Hawaii, the ripe fruits are used to draw out the pus from infected boils. Australian aborigines used the fruit in herbal medicine for coughs and colds. The leaves, root/rhizome and green fruit have traditionally been employed for menstrual cramp treatment. The root has been used for treating urinary difficulties. Presently people drink the juice as a regular health tonic and for cancer, diabetes, and cardiovascular disease. The fruit and leaves of morinda are used to create teas, tablets, and capsules. The fruit is mixed with other fruits to make juice. In laboratory research, morinda has shown immune stimulating, antioxidant as well as tumor-fighting properties. The results suggest morinda may merit additional study for conditions like cardiovascular disease and cancer. Experiments under laboratory conditions showed dietary morinda juice improved physical endurance within mice. A pilot study done on distance runners showed improved endurance capacity when morinda juice was consumed over three weeks. The long-term effects and safety of morinda juice as well as other morinda products have not been studied. People on a potassium-restricted diet because of problems with their kidneys should not use morinda. Few side effects have been reported from using morinda, its safety has not been adequately studied. There have been a few reports of liver damage in Europe from using morinda. It should be avoided if you have liver disease because it contains compounds that may make your disease worse.